Melbourne, the quirky Australian city, is a backpacker’s paradise with the beautiful Yarra river, the seaside in St. Kilda, the buzzing city centre (known as the CBD) and plenty of party options. Travellers instantly fall in love with Melbourne’s laid-back and bohemian vibe, the great coffee and music-scene, art, events and cultural activities. It’s an easy to navigate city, with world-famous street-art around so many corners. It’s obvious why Melbourne often gets voted as ‘the most liveable city in the world’ and so many backpackers come over to experience these city vibes for themselves! While making the decision to visit is pretty easy, finding the right hostel can be trickier as the options are endless. Which is why we’ve collected the best Melbourne hostels, in our favourite neighbourhoods, for you. Are you looking for a cosy home away from home? Look no further, because Victoria Hotel Backpackers is exactly what you need. Check out its awesome facilities, spacious rooms, 3 common areas (all good things come in 3’s, don’t they?) a dining room and a balcony. Meet the friendly staff and get the best tips for exploring Melbourne, chat with people from all over the world and be prepared to stay longer than planned. It’s this hostel’s friendly atmosphere that makes it a really special place to stay and with Brunswick as the location, you will be right in the city’s cultural hub with amazing bars, an alternative music scene and some amazing streets to explore. If you plan on settling down for a while, this hostel is a great place to choose. It’s located right in the city centre, where you’re a quick walk away from the city sights. But with its regular events, like wine and cheese night, family dinners and sangria nights, you might not even want to leave the hostel! If you do manage to tear yourself away, make sure you take a ride on Melbourne’s iconic tram. You’re in the right spot as this hostel is within the ‘free tram zone’ – So, yep you can travel for free! If you’re planning to work to fund your travels, this is a great spot to reach the city’s businesses and explore job opportunities. If you are a solo traveller coming to the Ritz, you won’t be alone for long. It’s the perfect place to socialise and make a ton of friends. It’s located right in the heart of St. Kilda, on the vibrant Fitzroy street and just a short walk to St. Kilda Beach with its amazing Luna Park, the beautiful Esplanades and lots of bars and restaurants on the vibrant Acland street. The Ritz offers various activities and extras during the week, like free pasta Mondays, wine and cheese Wednesdays, trivia nights and beer- (or goon-) pong on Saturdays. On Sundays, it’s time to mingle together for a movie night in the cosy common area. You can chill out on the terrace with other backpackers and enjoy a bit of sun before heading into St. Kilda’s nightlife. The friendly staff will help you have an amazing stay in Melbourne. With plenty of areas to socialise it’s impossible not to meet new people and we’re sure you’ll make friends for life. This hostel will find a place in your heart in little to no time as the staff are very helpful and the hostel layout creates a great, natural vibe. The spacious common area and the terrace make it easy to meet other travellers, so get mingling and you’ll have new friends to explore quirky St. Kilda with. 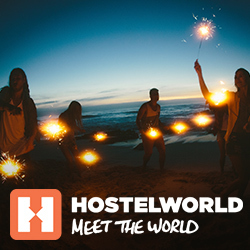 The hostel events are also a great place to find your travel tribe. Collect awesome memories at the hostel’s Bar Hop while you get shown around St. Kilda’s nightlife, win awesome prizes at the Trivia nights and show your killer skills at pool. As Melbourne is a melting pot for great artists, Habitat HQ hosts amazing life music sessions from the best local artists in their lounge EVERY Sunday, so be ready for some awesome jams. Do you need anything else for a perfect stay? Free pancakes on Wednesday’s will do! Exploring Melbourne with your partner in crime? Once you’ve strolled together through the romantic laneways and watched the sunset on the beach, you’ll need the perfect place to end your day. These hostels will make your trip unforgettable. Are you looking for a romantic, luxury getaway on a backpacker budget? Lucky you, because the Space Hostel in Melbourne will give you the best of both worlds. Enjoy the comfort of cosy private rooms, a gym to keep you fit and healthy, a pool to relax in and the bar and restaurant for a dinner for two for not more than the usual hostel price. Feeling pampered and relaxed? Time to head out for an adventure in Melbourne Central, the Queen Victoria Market, Carlton Gardens, Melbourne Museum or a romantic night in the IMAX cinema just next door. Melbourne Central is central indeed, it’s just a short distance from both the beach and the city centre and a perfect stay to enjoy some hostel-extras with your partner. Collect great memories by joining the Latino dance classes or listen to some live music at the hostel bar. More date ideas needed? Stroll along the Yarra River which is just a few minutes’ walk away and head to the Eureka Skydeck to watch the sun set behind the Melbourne Skyline. The location of the hostel is ideal to enjoy the best city sights and some romantic nights out (or in!). Sometimes, home is where the… party starts! Melbourne is known for its vibrant music scene and cool downtown clubs and you can expect the same fun in its party hostels! Whether you’re meeting new friends you can head off into the night with, or stay in the hostel to party, these beachside places know how to throw a good fiesta! Just a few minutes away from the beach, restaurants, shops and pubs, this hostel is the perfect place for party animals. It’s ideal for travellers who are looking for a young crowd to hang out with rather than getting a good night’s sleep. Head to the hostel bar, where they host an event nearly every night and find your party people! If you feel rough in the morning, don’t worry as there’s nothing the free, vegan-friendly breakfast can’t fix. Base St. Kilda will be your base for partying, with an absolute legendary in-house bar and lots, and I mean loooooads, of events. It’s the #1 entertainment-based hostel in town and the Red Eye Bar is a popular spot for all backpackers in Melbourne, especially in St. Kilda, so prepare yourself to meet the young and international party-crowd. Base’s events are anything but boring: be the best bad-looking guest at the hostel’s fancy dress thrift-shop competition and show your moves with a chance to become Queen or King of St. Kilda (and win 75 Dollars!). Attend the Friday night pub crawl to experience St. Kilda at night, be ready for a ‘Sunday Funday’ with soccer in the park and win some great prizes – as great as a trip to the ‘Great Ocean Road’. On Mondays it’s all about Big Willy’s Bingo. If your motto is ‘work hard, play hard’, you can also look at the job board or attend the regular Job ‘speed-dating’ at Base Hostel to find a job quicker than you can say ‘one more beer, please’. One thing is for certain – there won’t be a single boring minute at Base hostel. In a vibrant city, you sometimes need a place for some me-time. Lucky you, because Melbourne has some amazing hostels with private rooms! Standing out as one of the most affordable hostels with private rooms, Hub Hostel also offers you a great location in the quiet North of Melbourne. Backpackers love it for its snug family vibes and it even looks like a big, cosy family home. If you’re down for some hustle and bustle, you can just hop on to the tram and head straight into the city centre to explore the nightlife and the best cafes, bars and pubs. This 135-year-old historical mansion is a hostel which has a special charm and is a cosy place to call home for a while. With a friendly atmosphere in the common room and outside area, you can have a lot of fun meeting new people, while still enjoying the privacy of your own room. The private rooms in this hostel are not too pricey, so they shouldn’t break your backpacker budget. You’ll be staying in an area called Prahran, which is only a short walk from Melbourne’s alternative Chapel Street, with some of the best vintage stores and nights out, and the popular St. Kilda beach. Trams will take you to the city centre in no time, so you can soak up all the Melbourne fun and sun while staying at Lords Lodge Backpackers. Stepping out of the door and right into the city centre sounds like a luxury, but with these Melbourne hostels you can have it all for a backpacker budget. Flinders Backpackers is not only a hostel, it’s also a cinema, an event venue, your gateway to the city centre as well as the iconic Flinders station and the HOSCAR winner for the most popular hostel in Melbourne 2017 and 2018 – applause! Their awards are well-deserved, as they’ve got an amazing free all-you-can-eat-breakfast, unlimited pancakes, helpful staff who will give you all the best tips, free city tours and they attract lots of travellers who will soon be your mates. If you can still move after all the free tasty food, head to the HUGE common area and enjoy some films or the free pool table and walk it off during the free walking tour where you can go and explore the city. Ever heard about the infamous ‘Goon’ (boxed wine)? Try it when the hostel is serving its Goon Punch on Fridays and experience backpackers’ number one drink. With free comedy nights and karaoke, Flinders Backpackers is bringing Melbourne’s artsy culture into the hostel and as the city is also famous for delicious food, there’s a free weekly meal night – serving you delicious treats from different cuisines. A perfect place for adventurous hungry backpackers that want to experience Melbourne’s charm while saving some $$$. Another hostel close to Flinders Street Station and an equally awesome pick. With its funky Melbourne inspired interior and laid-back atmosphere, travellers fall in love at first sight. The buzzing basement bar hosts various events where you can meet other guests. Enjoy free pancakes for breakfast to get fuel for the free city tour or step out of the hostel right into the centre and explore the city and its sights in your own time. Book some life-changing trips through the hostel staff and they’ll make sure you don’t miss any city highlights. You can even book a trip to the Great Ocean Road here so you’ll not only experience Melbourne, but all the great places in Victoria. This hostel has an awesome perk right on top of it: Laze on the rooftop after a true Aussie meal from the barbie and overlook the city while you chat to new friends and enjoy an amazing sunset. The best part? Your bed will only be a few steps away in the Melbourne Central YHA. Located right in the city centre and with an awesome terrace and incredible views, it will give you all the urban city vibes and an amazing photo spot. What are you waiting for? Melbourne hostels are an awesome way to really dive into the city vibe. With a vibrant culture and a buzzing music scene as well as tons of things to do, you shouldn’t miss out on these hostels that give you a truly unique experience. Do you like vintage? Then this one’s for you! The best of 19th century vibes and modern Melbourne charm makes The Nunnery hostel an absolutely unique stay. Located right in the alternative and hip neighbourhood Fitzroy, it’s close to the city and a true gem. Meet other travellers in the common room, the balconies or the courtyard and head out together to get a taste of Melbourne’s live music scene, alternative cafés, bars and the iconic laneway nightlife. A free weekly pub crawl and a free breakfast make the perfect stay complete. The historic architecture combined with Melbourne’s modern atmosphere will make it feel like time-travelling! Landing Pads Brunswick is an ideal hostel to get you settled into a new city, with a really homely feel. The team here will give you a kickstart if you are on a working visa, helping you to find a job with tutorials and contacts, and providing a place you’ll feel at home in with likeminded travellers. With events like movie nights and family dinners, this is a great place to base yourself. What sounds better than starting an exciting adventure in a metropolitan city with new friends? This place is the ideal base for creative minds and backpackers who want to get the best out of Collingwood’s cultural scene. It’s not a showy place and keeps its promotion low-key which makes it a top secret tip. Great if you are planning to stay for a while, or if you are looking to get the best of Melbourne’s cultural and artsy scene. Words from a backpacker: ‘Set in the midst of the coffee and cake fuelled scene that is Collingwood, Collingwood Backpackers is typically laid back and easy going. Its staggering distance from the popular and vibrant Brunswick street, with bars, live music events and atmosphere. A short tram ride is all it takes before you are in the depths of Melbourne city centre with shops and bars galore (…)’ and no matter if it’s a short or a long stay, you will get a glimpse into real Melbourne life. This is one of the cheapest places to stay in Melbourne’s cute neighbourhood, Fitzroy. Most backpackers stay for a long time and it’s a great opportunity to find some good mates if you are new to the city. Explore Melbourne’s bohemian culture and the thriving art and music scene right in the heart of Fitzroy. Live with some artists themselves as the hostel is popular for independent musicians and bands that have gigs in the city. Welcome to the Rock’n’Roll life! Feeling ready for Melbourne? We hope we could help you finding a place where you can start the time of your life in Melbourne. Did you already stay in one of those hostels? Share your experience in the comments and help others have the perfect trip. Enjoy Melbourne!